For other uses, see Agdam (disambiguation). 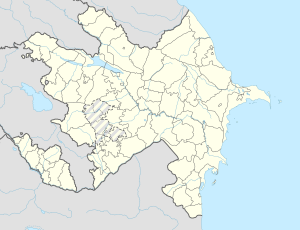 Ağdam (also spelled Agdam or Aghdam) is a ghost town in the southwest part of Azerbaijan and the formal capital of its Agdam District, today controlled by the de facto Republic of Artsakh, but de jure internationally recognized territory of the Republic of Azerbaijan. Founded in the early 19th century, it grew considerably during the Soviet period and had 28,000 inhabitants by 1989. Armenian forces captured Agdam in July 1993 during the Nagorno-Karabakh War. The heavy fighting forced the entire population to flee eastwards. Upon seizing the city, Nagorno-Karabakh Republic (NKR) forces destroyed much of the town to discourage Azerbaijanis from returning. More damage occurred in the following decades when locals looted the abandoned town for building materials. It is currently almost entirely ruined and uninhabited. According to the United Nations Security Council's resolution #853 that 'Demands the immediate cessation of all hostilities, calls on withdrawal of Armenian troops from Agdam and other recently occupied areas of the Azerbaijani Republic and reaffirms UN Resolution 822'. In November 2010 it was renamed by the NKR government to Akna (Armenian: Ակնա). It is administratively part of the town of Askeran, which is located some 10 km away. The city's name is of Azerbaijani origin and means "white house", where ağ means "white" and dam is "house" or "attic", thus referring to a "bright sun-lit, white house" which was given by Panah Ali Khan of the Karabakh Khanate. Another possibility is that it was derived from ancient Turkic glossary meaning "small fortress". In the distant past, Turkic speaking tribes built small fortresses for their protection and safety. 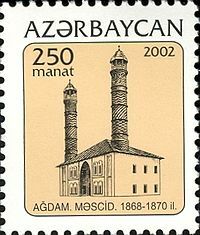 Agdam was founded in the 18th century and granted city status in 1828. It is 26 km (16 miles) from Stepanakert (Khankendi). Before the Nagorno-Karabakh War, butter, wine and brandy, machine factories and a railway station functioned there. Agdam was the scene of fierce fighting during the Nagorno-Karabakh War. According to journalist Robert Parsons, Azerbaijani forces used Agdam as a base for attacks on Karabakh, launching BM-21 Grad missiles and bombing raids from there against civilians. During the Battle of Aghdam, Armenian forces violated the rules of war by hostage-taking, indiscriminate fire, and the forcible displacement of civilians. As the city fell, almost its entire population fled eastward. The Armed Forces of Armenia still use the city as a buffer zone, meaning that Ağdam remains empty and decaying, and usually off-limits for sightseeing. The ruined city once had a population of almost 40,000 people, but today it is an almost entirely uninhabited ghost town. All the houses are ruined, some by shells fired in the war, others due to looting for building materials. According to Azeri sources one of the buildings to be stripped of materials is the Agdam Mosque, which has been converted into a barn for cattle and pigs. Its derelict condition, including a missing roof, drew criticism from Azerbaijani and Turkish communities, who wrote a letter in 2010 to Pope Benedict XVI asking him to warn Armenians (though Armenians predominantly follow a church which broke with Rome in the 6th century) about the situation. But according to Armenians the mosques in Karabakh are mostly perceived as an Iranian cultural heritage not Azerbaijani heritage and the mosque has never been used so. It is closed nowadays. Also, according to Artsakh republic authorities the roof of the mosque was restored. In 2008, the Lonely Planet guidebook dubbed the city as "Caucasian Hiroshima". Mugham music, a tradition in the Karabakh region, is an important part of Agdam's musical heritage; the city was home to Agdam Mugham School, which produced "Karabakh nightingales" ensemble. Despite the invasion, the town is represented by a professional association football team competing in the top-flight of Azerbaijani football – Qarabağ FK, currently playing in the Azerbaijan Premier League. The Imarat Stadium, which was Agdam's only stadium, was also destroyed by bombardments from Armenian military forces during the Nagorno-Karabakh War. Some of the city's many prestigious former residents include military commanders Allahverdi Bagirov and Asif Maharammov, footballers Ramiz Mammadov, Mushfig Huseynov and Vüqar Nadirov, mugham singers Gadir Rustamov, Mansum Ibrahimov and Sakhavat Mammadov, actor Jeyhun Mirzayev, scientist Zakir Mammadov and singer Roya. Vüqar Nadirov is one of Qarabağ FK's most capped players. ^ "Caucasus City Falls to Armenian Forces". The New York Times. 24 August 1993. In July, Armenian forces forced out the defenders of Agdam, Azerbaijan. ^ Specter, Michael (2 June 1994). "Azerbaijan, Potentially Rich, Is Impoverished by Warfare". The New York Times. Cities like Agdam have been emptied of people. ^ "Armenian separatists rename Azeri town". azernews.az. 3 November 2010. ^ "July 23 marks 21st anniv. of Akna (Aghdam) liberation". PanARMENIAN.Net. 23 July 2014. ^ Musayelyan, Lusine (26 April 2011). "Life Among Ruins of Caucasus' Hiroshima". Institute for War and Peace Reporting. ^ a b "Agdam city". Ministry of Culture and Tourism of Azerbaijan. Archived from the original on 20 July 2012. Retrieved 26 July 2010. ^ Значение слова "Агдам" в Большой Советской Энциклопедии (in Russian). Soviet Encyclopedia. Retrieved 26 July 2010. ^ Агдам (Азербайджан). Landmarkers.ru (in Russian). Archived from the original on 9 March 2012. Retrieved 26 July 2010. ^ Girchenko, Yuriy. Юрий Гирченко. В Союзе все спокойно... (in Russian). Retrieved 26 July 2010. ^ Parsons, Robert (3 June 2000). "Tug-of-war for Nagorno-Karabakh". BBC News. Archived from the original on 27 April 2010. Retrieved 26 July 2010. ^ Human Rights Watch. Azerbaijan: Seven years of conflict in Nagorno-Karabakh. p.19. ^ Paul, Amanda. "Agdam – an Azerbaijani ghost town". Archived from the original on 19 May 2011. Retrieved 18 May 2011. ^ Hannigan, Chris. "Ghost Towns: Ağdam, Azerbaijan". Archived from the original on 13 August 2010. Retrieved 26 July 2010. ^ Chauffor, Célia. "Report: Agdam, ghost city". Caucaz Europenewz. Archived from the original on 1 July 2010. Retrieved 26 July 2010. ^ "20 Abandoned Cities from Around the World". Daily Cognition. Retrieved 26 July 2010. ^ Esslemont, Tom (25 June 2009). "Karabakh guns still at the ready". BBC News. Retrieved 21 February 2018. ^ "Turks complain to Pope on vandalism in Karabakh mosque by Armenians". Archived from the original on 20 July 2010. Retrieved 26 July 2010. ^ Lonely Planet Georgia, Armenia & Azerbaijan (Travel Guide). Lonely Planet Publications. 2008. p. 301. ^ "Dark Tourism's Agdam". dark-tourism.com. Retrieved 14 November 2014. ^ "Agdam Climate Normals 1961–1990". National Oceanic and Atmospheric Administration. Retrieved 22 March 2015. ^ a b c "Azərbaycan". pop-stat.mashke.org. ^ "Агдамский уезд 1926". ethno-kavkaz.narod.ru. ^ "Агдамский район 1939". ethno-kavkaz.narod.ru. ^ "Агдамский район 1959". ethno-kavkaz.narod.ru. ^ "Агдамский район 1970". ethno-kavkaz.narod.ru. ^ "Агдамский район 1979". ethno-kavkaz.narod.ru. ^ "Новости-ARMENIA Today-Карабах: Агдам переименован в Акна". armtoday.info. Retrieved 2017-09-26. ^ Shirinov, Elnur. ""Qarabağ bülbülləri" nin yaradıcısı kimdir". Retrieved 14 November 2014. ^ Золотой голос Карабаха – Гадир Рустамов. karabakhinfo.com (in Russian). Retrieved 14 November 2014. Wikivoyage has a travel guide for Agdam. Pictures of the deserted town: "Abandoned War-Torn City of Agdam, Azerbaijan"
Pictures of the deserted town: "Aghdam"
"Clashes Intensify Between Armenia and Azerbaijan Over Disputed Land". The New York Times. January 31, 2015. This page was last edited on 16 April 2019, at 04:17 (UTC).